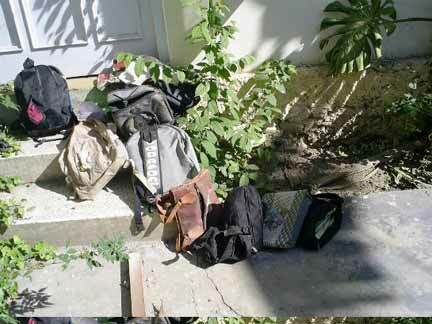 These bookbags outside a collapsed school building belonged to students who were killed in the earthquake. For more pictures click here. At 3 a.m., on Saturday morning while I was studying for my SAT that day, the phone rang. To my surprise it was my brother-in-law Tanveer in Pakistan. While I was on the phone, my mom, who was woken up by the ringing of the phone, also came downstairs . She was shocked to see the expression on my face. She was curious to know what had happened. I gave the phone to her. “There is a big earthquake here. But we are fine by the grace of God,” my bother-in-law said in a nervous voice. Immediately my mom inquired about my uncle, Adnan Malik who resided in Islamabad. “We are trying to contact them but we couldn’t communicate with them yet,” continued Tanveer. There was a panic in my house. My mom looked very tense and worried. I hurriedly went upstairs and woke up my dad and my grandma. After listening about this dreadful event, they were shocked. There was great sadness in my house. My dad immediately called my uncle but we too were unable to communicate with them. Then he called my uncle’s elder sons home in Lahore, Pakistan. There his wife told us that he had left to see his father in Islamabad. But she told us that my uncle’s apartment building was severely affected by the earthquake. Then on Sunday morning, my uncle’s son Amir called us and sadly reported. “Ammi [mother] is no more with us. Bhaiya [brother] also went with her,” he said. He also told us that my uncle in seriously injured and was in the hospital in Lahore. After my family talked to him, I grabbed the phone from my grandma. I could not believe that the person who was so friendly himself was broken today. I could feel the trauma he must be going through. After he hung up the phone, I could see the lamented feeling in my house. Later we learned that my brother-in-law had driven to the apartment building in Islamabad. After reaching there, he could not believe his eyes. It seemed that everything was destroyed. He was not allowed to go to the building, Margalla Towers, so he drove to my brother-in-law’s house in Pindi which was about 45 minutes drive from there. My brother-in-law had some connections so they went there. There he discovered the most shocking news which shattered him. He found the dead bodies of his mother and his brother, Abid. People were still looking for my uncle and suddenly he was found buried under the crushed building. It was a miracle that he was still alive but was seriously injured. Doctors admitted him in the hospital and told his son that there was little chance of his living since he was seriously injured and was old, too. But after some days, we again got a call from him. “Abu [dad] is out of danger now. He is fine. But the doctors said that he still had to stay in the hospital for a month” Amir told us. Everyone was so happy. But it was only after that he told us that now after the operation, his father could not walk. His legs were seriously injured and they had to cut off one of them. But he was still happy because he got his father back from the mouth of death and now he would be living with them. I knew he wished if could have said the same thing about his mom and brother. But then I remembered my grandmother saying that this life is transitory and everyone has to go one day. It was written in their destiny and no one can change it.